This paper is written within the context of the West Texas Coalition for Innovation and Commercialization initiative, which was spawned out of Texas Governor Rick Perry’s 2004 vision of building the future economy of Texas. That vision builds a competitive advantage for Texas through six target industry clusters: advanced technology and manufacturing, aerospace and defense, biotechnology and life sciences, energy, information and computer technology, and petroleum refining and chemical products. The West Texas Coalition for Innovation and Commercialization initiative was launched when economic development directors from Abilene, Amarillo, Lubbock, Midland, Odessa, and San Angelo convened to fulfill the Governor’s vision. This initiative is realized through the Texas Emerging Technology Fund which provides a facility to assist start-up companies and to commercialize research and development results. 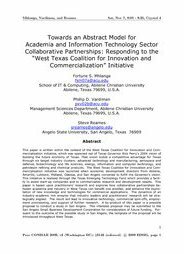 This paper is based upon practitioners’ research and explores how collaborative partnerships between academia and industry in West Texas can benefit one another, and enhance the exploitation of new knowledge and technologies for commercial applications. The dynamics of an industry-academic link ensures that industry leaders and practitioners’ research will be strategically aligned. The result will lead to innovative technology, commercial spin-offs, employment provisioning, and support of further research. A by-product of this paper is a possible proposal to conduct a study in San Angelo. This intended proposal may be submitted to the San Angelo Small Business Development Corporation for consideration of future funding. Pursuant to the outcome of the possible study in San Angelo, the template of the proposal will be introduced throughout West Texas.